The Exo-Guardians' leader, Zigvigix, has been forced by recent events to revaluate the Society's arsenal of weapons. They order a new exploration mission to the irradiated nuclear wasteland world of Elytrio, homeworld of the beetle-like ghibrani species. Far from the homes of the surviving ghibranis, the PCs travel into a missile silo that contributed to the death of a world. What deadly weapons can the PCs find and what further concealed truths are there to uncover about the history of the ghibranis? 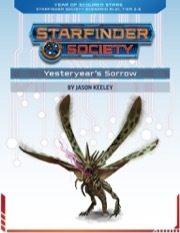 Content in Yesteryear's Sorrow is a continuation of the Starfinder Society scenario, Starfinder Society #1-03: Yesteryear's Truth, however, playing this previous scenario is not required. For starters, I highly recommend playing through Yesteryear’s Truth before playing Yesteryear’s Sorrow. It will be infinitely more interesting if you have. During this mission your players will be escorted to their destination by one of two possible local guide. Both of these characters are originally from Yesteryear’s Truth, and which one joins you will depend on who your player’s befriended in that previous scenario. Both guides have different skills, benefits, and tactics, which is really nice to see. I ADORE the new fey that was introduced in this scenario. The art for this guy is wonderful. There’s an intriguing social encounter right near the beginning which you can choose to get involved in (or not). This encounter teases events that will be occurring during the Against the Aeon Throne Adventure Path, which is a neat tie in. This scenario featured nice ecological information on all of its enemies and hazards, which I always enjoy and gives GMs something interesting to tell their knowledgable players. The location explored in this scenario is very, very, large, and although lots of areas are thoroughly detailed, others are entire floors summarized by a single sentence. Due to the length of Society Scenarios, striking the right balance between detail and brevity in important and unimportant areas is difficult to say the least. Sometimes it works, and sometimes it doesn’t. I thought that this scenario did a wonderful job of finding that sweet spot. The location felt vast, without feeling rushed or skimmed over. Obtaining your objective is both challenging and fun. There’s a wonderful selection of player handouts which will be of particular interest to those of you who have played through Yesteryear’s Truth. This scenario also did a wonderful job of slowly cultivating a spooky atmosphere, closer to the end. Although it wasn't amazing or deep like Yesteryear's Truth, I thought this scenario was interesting and fun. I ran this at low subtier using the four-player adjustment. Overall, I found it rather average and unremarkable. For reasons discussed below, I came in with high expectations and came away somewhat disappointed. There's nothing particularly wrong with Yesteryear's Sorrow: it's a straightforward scenario that will lead to a satisfying session's worth of game play. But it's not going to win any awards, either. I don't think it's a huge secret that Yesteryear's Sorrow is a sequel to one of the best SFS scenarios ever, # 1-03: Yesteryear's Truth. In that instant classic, the Starfinder Society landed on the planet Elytrio on a first-contact mission with the native Ghibrani. They found that, millennia earlier, the planet had been devastated by nuclear war and that the survivors had gradually split into two distinct sub-species. One sub-species stayed in the protected cities, while the other pursued the prophecies of their new deity and struggled to live in the barren wastelands. The climax of Yesteryear's Truth was that the outcasts' new religion was based on an intentional ruse by the city-dwellers to free up resources! The PCs had to make a difficult moral decision on whether or not to reveal the secret. 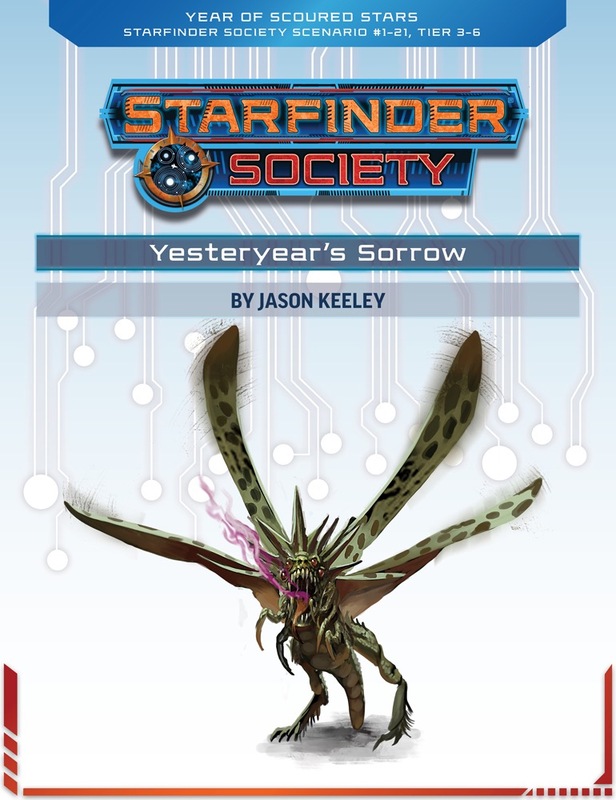 In Yesteryear's Sorrow, we find out that the "official" outcome was for the Starfinder Society to keep secret what they learned. Zigvigix starts the briefing in a funny bit, immersed in a video game, before explaining to the PCs that they're headed back to Elytrio. Given the threats in the Scoured Star system, the SFS has decided it needs to beef up its armament and self-defense capabilities. An abandoned underground bunker at a ruined military base on Elytrio might just do the trick. The PCs are given several "locator disks" to mark any caches of weapons they find in the base for later pick-up, and are promised a local guide will meet them near the base. The journey to Elytrio is punctuated by a minor incident that foreshadows the Against the Aeon Throne adventure path. I like these little cross-connections, though I do think care needs to be given that they don't tempt PCs to try to immediately investigate and solve problems that the scenario can't give them any resolution on. Once on Elytrio, the PCs will meet their guide, which, in a nice touch, could be one of two different NPCs depending on whether any players went through Yesteryear's Truth. The guide stays with the PCs for the entire rest of the scenario, and proves most useful as a translator. When the PCs reach the rubble of the military base, they're accosted by a weather-related hazard: a "soarnettle squall" of razor-sharp thorns carried on the wind! They have to race to find the entrance to the underground bunker before they get torn to shreds, and have a few different options on how to proceed. I thought this encounter was structured well and was very exciting, as the longer the PCs took to find the hatch and remove the rubble that was blocking it, the more injured they're going to become. I also liked that just when they think they're set, they realize additional work has to be done to repair the hatch to get it to open! Hazards of continuing duration that require PCs to achieve particular goals in order to survive are far better than the "one saving throw and it's done" type. The bunker is a shaft that descends deep underground. By following winding ramps downward, the PCs will come across several levels that bear investigation. Level 2 has a weapons vault protected by some vermin called "Mutated Nighthoppers." The artwork is very cool and I liked their "leaping attack" ability. They're not hard to defeat. The level is guarded by an interesting trap that potentially infects the PCs' weapons with a virus that makes it slightly inaccurate; I like the concept, but removing the virus is too easy since there are no consequences for failed skill checks. Level 6 has a good challenge: a room with several weapon prototypes that is flooded with radiation. Basically, one or more PCs has to race into the room, try to find the valuable ones and retrieve them (some are quite bulky) before the radiation overpowers them. It's a good teamwork encounter. Level 10 has another nice trap, an area of collapsed rubble that can potentially be squeezed through; but if the PC fails the Acrobatics check, they take damage and can get stuck, with efforts to free them potentially hurting them more. Throughout the earlier levels, the PCs have constantly come across strange fungal growths on the walls and floors of some rooms. In addition, the various computer consoles they come across contain excerpts from the audio log of the base's commander (revealed to the PCs as handouts) that reveal his growing madness and paranoia. Slowly, the PCs will realize that it was this facility that launched the first missile strike in what became Elytrio's apocalyptic war. I like the concept, but I think it falls rather flat--"listening" to a series of conveniently-found log entries doesn't give the PCs any sort of personal investment in what happened because there's nothing to do but shrug and move on with the exploration. A plot that required them to pierce together the narrative in order to be successful, or use the logs to solve some sort of puzzle or mystery, would have engaged the players much more. Level 13 is the final level of the base. Here the PCs will engage Skorusko, a cruel fey creature called a "fear eater." Skorusko may not have caused the missile launch, but he did exacerbate the commander's paranoia to such a degree that he released a gas to kill everyone in the facility. As a combatant, Skorusko has some spelllike abilities to cause fear in his opponents--a very useful power, though it very well may result in a PC fleeing for the rest of the scenario's climactic encounter which is a bummer for that player. In addition, he has some confusion and hold person abilities. Still, he falls prey to the action-economy inferiority problem that consistently plagues PFS/SFS scenarios, and shouldn't be much of a challenge. He might delay or frustrate the PCs, but he's not going to come close to winning. Assuming the PCs have marked enough of the weapon caches, they'll have successful completed the scenario and receive a very useful boon on the Chronicle: the ability to outfit their starship with a limited number of nuclear missile launchers! Overall, I have to admit I was disappointed by Yesteryear's Sorrow. My expectations may have been too high, but I was hoping for another scenario with some really interesting world-building and the potential for great role-playing that comes from posing PCs with major moral decisions that have no obvious answer. Instead, this scenario blends into my mind with the several other "explore an abandoned complex on an alien planet" type of mission that we've seen already. The revelations about the war's origin held potential, but weren't used in an engaging way. What might have redeemed the scenario to some degree would be making the PCs think, hard, about whether they want to arm SFS vessels with the very same weapons that caused the destruction of an entire planet. Is there ever a point where a weapon becomes too destructive to use, even in self-defense? I know that not every scenario can be a philosophy debate club, but I was hoping that this scenario would continue its predecessor's ability to inject some more depth into the game. There is very very cool teaser in this scenario that ties to season 0 Pathfinder, sooooo cool. Wow! My Second Seeker PC, Kylex, became heavily invested in the events of Yesteryear's Truth and there was a bit of a conflict brewing between the characters about the final course of action they would take. Learning the ghibrani language became an imperative and Kylex vowed to be of service to their needs should he ever be called upon. I look very much forward to this chapter. I have no idea what to do with this one, an Exo-Guardian continuation of a Wayfinder scenario. "Ya'll already proved you can't handle these we'll put em to gooduse thanksbye"
Started a civil war by telling waaaay too much truth, then ran. Hi Fedor! While I appreciate your enthusiasm for the status of future Dead Suns reporting, I would kindly request that you not clog up all of the product page threads with the same post about them. If you have concerns, the proper venue would be to create a new thread in the Organized Play boards, or if you'd prefer, contact me directly via email or private message. That being said, I'll take some time to answer the question here: The Dead Suns installments are intended to be open for reporting once the associated sanctioning document is ready. Currently, those documents are not yet ready for public distribution. I've talked about it in some other threads, but the short version is that we're focusing on making sure we get all our convention scenarios ready before we focus on wrapping up the Dead Suns sanctioning. This product uses two half-page custom maps. No other maps are required. Dr. Strangelove vibe is strong in this one. A pretty fun scenario.